50 years since the 1967 war. 100 Years since Balfour. 70 years since partition. A launch of another anti-Israel campaign. And breathe. This week I have been busy, Friends of Al-Aqsa, suspect academia and Ben White. It is going to be a long year. A talk on the importance of the Al Aqsa Mosque by Ismail Patel, founder of the Friends of Al-Aqsa group. The hall only half full. In the past Patel has saluted Hamas for “standing up to Israel”, and has a long history of walking on or over the line. On Tuesday the Ismail Patel I witnessed was careful, guarded. He was clearly aware of the presence of supporters of Israel. There were no references to terrorism or Hamas at all. But terror related comments are only the headline act of the Friends of Al-Aqsa. Their underlying premise remains constant. The Mosque is under threat by right wing elements inside Israel and must be protected. In this, Friends of Al Aqsa present the true face of the Palestinian cause. It is not humanitarian in nature, but rather anti-Jewish and easily incited through talk of religious threats. Patel’s talk did exactly this. He firstly created myths around the mosque, using a recently fabricated historical narrative that places Jerusalem and the mosque at the pinnacle of the Islamic ladder. Patel then launched into a carefully worded attack on Israeli intentions. Using selected quotes and badly distorted information to suggest the movement to destroy Al-Aqsa and build a Third Temple, is moving into the mainstream. This narrative, along with Patel’s assertion that the Jews continually break the ‘status quo’ and deny Muslims access, is intended to bring about religious fueled anger and emotional engagement in those that listen. For this reason universities should be very careful about allowing this type of religious narrative into the student areas. The same call to arms took place in 1929 and led to massacres of Jewish communities. Just last year, the sudden spate of terror attacks were started by claims over the status of the Temple Mount. Since before 1920, such false calls have preceded many violent attacks against Jews. Today, on the 18th November, as part of a campaign, Friends of Al -Aqsa are handing out leaflets on campus throughout the UK. 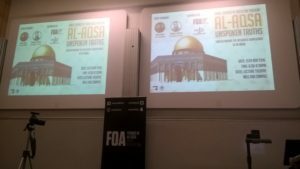 They say it is about “educating people about masjid al-Aqsa and putting al-Aqsa on the global political a genda in order to protect and defend Masjid al-Aqsa from Israeli colonisation”. Or in direct language, Jews are going to destroy the mosque and Muslims need to protect it because it is central to Islam. Nothing about human rights at all then. The Jews were at the event of course, the Nuterei Karta. After the event I managed to speak to them and I was educated about how Zionists control global media. Ever present at every anti-Israel action, this handful from an extreme sect are evidence of the desperate absurdity of the anti-Israel cause. I had wanted to ask a question during the Q&A, but was not chosen so after the event I also went to talk to Ismail Patel. During the evening Patel had spoken about the importance of Muslim ownership and the required subordinate nature of Jewish people on Muslim holy sites (if they are ever allowed at all). FOA are major supporters of the boycott Israel movement. The central pillars of BDS are all about equality and human rights. At moments such as this the wide divide between the stated goals of the BDS movement and the realities of Muslim society and religious demands are highly exposed. I wanted to challenge him on the contradiction between pushing the supposed equality of BDS and demanding Jewish subordination. 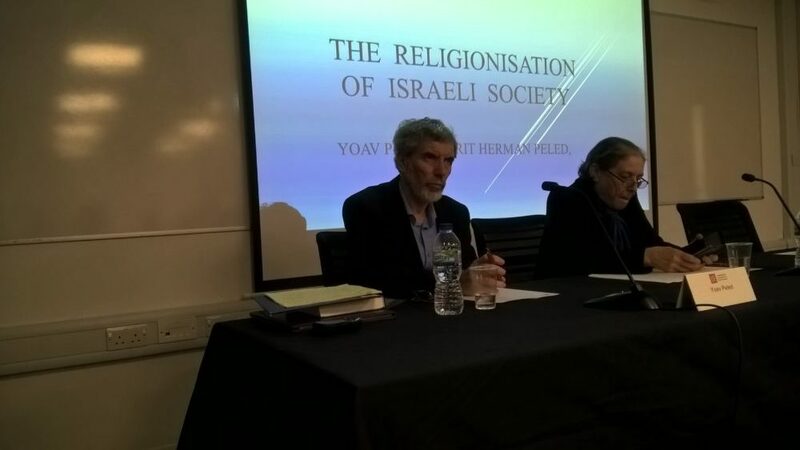 The event at LSE was to be entirely different. I didn’t have tickets and the website confirmed the event was ‘sold out’. Not the first time I have needed to ‘blag’ a little. I was early enough to get a front row seat. Successfully gatecrashed. 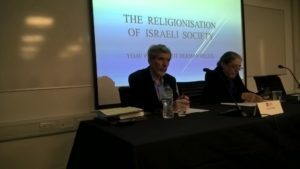 A husband and wife double act at the LSE presenting their academic arguments about the ‘religionization’ of Israel. Professor Yoav Peled (Tel Aviv U) and artist / activist Horit Herman Peled. 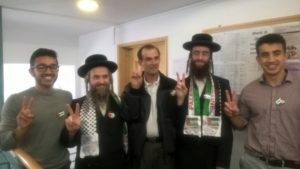 Yoav’s brother Miko Peled, himself an activist, has recently run into trouble in the United States for comments he made about Jews being “sleazy thieves”. Yoav’s sister Nurit Peled-Elhanan is another with a long history of pushing extreme positions. In what one assumes is a search for a perverse form of ‘justice’, she suggested that George Bush should have been killed in the Twin Towers terror attack. Personal dislike of religious people aside, the essence of their thesis is built on statistical comparisons between 1990’s Israel and Israel of today. It forms part of a post-factual world where one’s opinion becomes more important that the glaring holes that are apparent in the manner in which the separate elements have been brought together. Primarily, this viewpoint is one-sided. The comparison with ‘secular Israel’ is missing. Which renders this work entirely dismissive of competing secular manifestations within Israeli society. A point directed towards the Peleds during the Q&A. 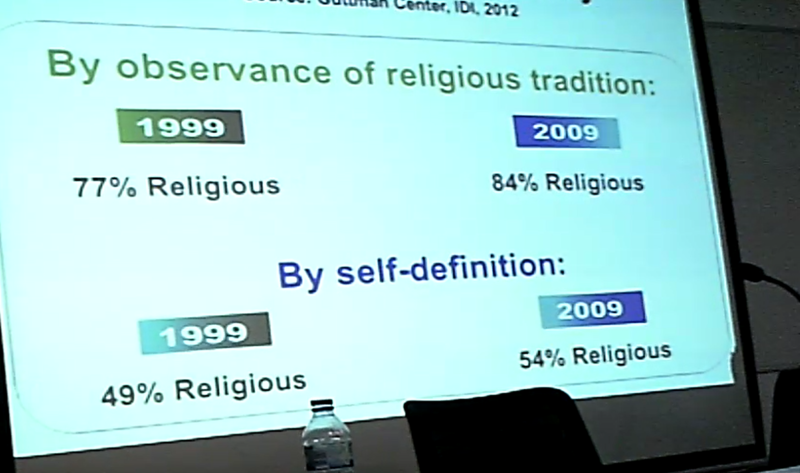 He also presented a slide that suggested 84% of Jewish Israel gives itself towards some type of religious observance. When questioned on this specific slide and asked if he truly believed if this was a proper representation of Israeli society, Yoav replied ‘absolutely’. This is absurd because it disregards cultural influence. It is like using the exchange of Christmas gifts as a way of measuring ‘religious observance’ in the United Kingdom. What percentage of us exchange such gifts, how religious does it make the UK? The underlying error however in reliance on these data sets, was that one simple piece of information was missing from the presentation. That Israel of the 1990’s received a secular boost like no other. A million Russian immigrants. It is now one generation on. These immigrants have had children and have been immersed in Israeli society for 25 years. The influx brought ‘white meat’ (pork) into Israeli markets and high street butchers. Unless you remove these people from the statistics, receive a similar infusion in Israel today, or somehow adjust for the impact they must have had, your entire methodology is too weak to withstand investigation. Like the Islamic speaker at Queen Mary, and what I was about to hear from Ben White, Yoav Peled was presenting a case by selecting a conveniently chosen but ultimately dishonest narrative. His ideology was the driving force, and without an audience keen to pick up on an anti-Israel narrative, this thesis would get no further than the local garbage bin. My position does not mean Israel is not getting more religious, it only puts forward that this particular method of judging the religious impact in Israeli society is worthless. It must be said, this hatred is not similar to the Islamic event at the university the night before. Nor is it part of the attack Ben White delivers. Yoav is a Marxist and his ideological opposition is an internal Israeli dispute. But it does have elements in common with the other two. A disregard for truth. A willingness to let ideology direct the evening. It is also true that most of the student audience remains unaware of the flaws in the presentation or the level of hatred that exists, in some parts of Israeli secular society towards the religious community. This means that this presentation is delivered out of context. 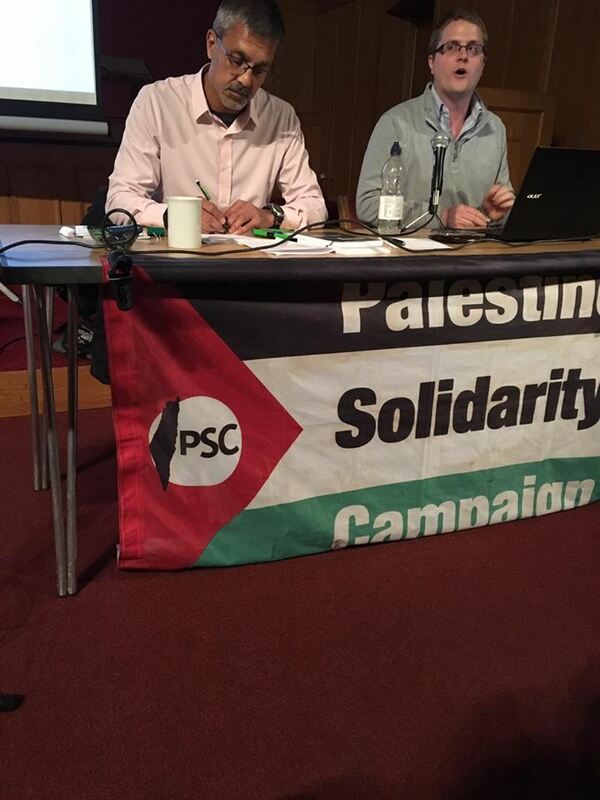 Ben White was speaking on Gaza at a meeting of the West London branch of the Palestine Solidarity Campaign (PSC). Perhaps 50 attended. 15 came to challenge the narrative, so 35 turned out to hear one of the movements leading lights. Free admission, well advertised. Embarrassing numbers. White is an experienced campaigner. He has been doing this type of event for many years. Ben’s strategy is simple and similar to Max Blumenthal’s; he drowns the audience in place names and statistics. The talk was in four sections. One focusing on the Nakba, the second the blockade and the third element was to press home Israel’s ‘brutality’. The final element was to ensure he weaved the narrative together to advertise both the boycott movement and the reason for supporting it. A pre-arranged question from Salim, the evenings host, successfully managed to introduce ‘mowing the lawn’, the ‘Hannibal Directive’ and the ‘Dahiya doctrine’ into a single question. Impressive stuff Salim – well done! (you can read about all three – here). The audience at a PSC event is generally an older crowd. This type of event more of a moral boosting episode to the troops than an information gathering exercise. Perhaps they hope there will be one or two new members somewhere lurking in the shadows. White’s narrative is poison. I have spoken to Ben several times. On occasions, he spoke to me thinking I was an anti-Israel activist. By now he recognises me instantly (I was sitting next to him at a coffee shop near the venue). White is an intelligent guy. In 1:1 discussion and when probed he can display a clear ability to critically analyse internal Israeli society. He showed glimpses of that last night when he spoke of societal fault lines in Israel. Which makes the narrative he presents even more problematic. He isn’t ‘informing’ or ‘educating’ and he has to know it. As he weaves his picture through carefully selected facts and deliberately side-stepped minefields, Ben White is proselytizing. White always uses the worst-case statistic available to describe any event. He also omits any element of the ‘other side’. He twists any conflicting position around as if he is arguing in a university debating competition. It isn’t about what is real or not, only about how ingenious and innovative he can be, in building an alternative argument. An example here would be on his talk of human shields. He wanted to suggest Hamas did not use human shields, so made a convoluted and childish point over whether civilians have been moved into danger or the danger has been moved to the civilians. In reality. Hamas seeks to deter attacks on its own operatives and profits through strikes that result in high civilian casualties. Using human shields is a win-win for them. It is to insult the intelligence of everyone listening to defend the actions of Hamas during the 2014 conflict. Vile. That argument of course can be turned around. The blockade, Gaza, the settlements, the occupation, placing these “somewhere near or at the root of the problem would be really ridiculous too”. Even the events of 1948 occurred 19 years after Arabs were brutally murdering Jewish communities in Hebron and Tzfat. My piece on 100 years of Arabs murdering Jews with a knife would be a good place to understand this issue better. But he sidestepped here. When the two sides were talking in the 1990’s, Hamas policy was to brutally derail the talks. The impact on Israel was devastating. Strategies do change and if Fatah did conclude that negotiation and settlement were better paths to follow and Hamas remained on the other side of rational thought, then Hamas are central to the problem. Hamas are also religious in nature. The blockade on Gaza was a direct result of the actions of Hamas. As he had ample opportunity, White’s refusal to draw a distinction between Fatah and Hamas was unsettling. White gives Israel no options, because his narrative is not balanced enough to provide even a small window for the truth to climb through. In the story of Ben White there is no conflict. Things always ‘just happen’ to the Palestinians. Over twenty thousands Jews have died in this conflict. These are not worthy of a single mention. The Q&A did not go to plan. There were not enough of the anti-Israel side asking questions. As is always the problem there is not enough knowledge in the room. A man stood up. I have seen him twice at previous events ask a question on the use of white phosphorous . He did so again here. That must be his ‘thing’. They all have their ‘things’. After a while the host became visibly unsettled, he didn’t want to keep taking questions from the Zionist camp, and it became more difficult not to ask them. So, he called an ending to proceedings at 20:30. The event had been due to go on until 21:00. This action annoyed those who wanted to challenge White’s narrative and the evening fell apart into disarray. Watching white is always impressive because he is a circus performer. But he has no integrity. He is not interested in the truth. Nor is he searching for an end to the conflict. Ben White pushes a propaganda narrative that perpetuates conflict. Shameful. These events are the products of an industry of hate. There is no other explanation for the situation. The constant supply, the never-ending funding. A tiny sliver of land, several thousand miles away. A beacon of freedom in a region threatened by ever lengthening shadows of Islamic hatred. Millions have died within the borders of Israel’s neighbours. And yet the feeding frenzy on Israel’s soul continues. Those turning up at these events, do not care for human rights. They do not want to know about the real people that are suffering in the world. They are blind to the ongoing slaughter in Syria. Not interested in Genocide against Christian communities. They just need to suckle at the venom. They want to hear about the devil state in the Middle East. To hear Israel demonised. To have their hunger fed by the industry of hate. The disease has already taken over the party of opposition. The Student union is led by people with no place in their lives for Jews who are proud of their heritage. There are protests on campus when a gay, left leaning Israeli activist comes to talk. Students wear rugby shirts with a map on their sleeve that has obliterated Israel. Jews are spoken of in the House of Lords as having ‘caused the holocaust’. In the other chamber, there is talk of Jewish money controlling the government. Both right and left are weaponisng Jews to use as pawns in their own political battles. You cannot continually pump this poison into the atmosphere of the UK and not expect the local air to become infected. Jews are visibly not as welcome, nor as safe in the UK as they were ten years ago. 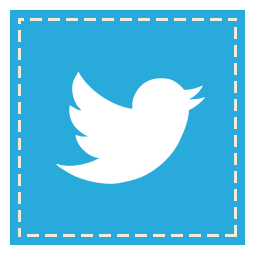 Remember, this is not an account of several interactions over months. It is a tale of the experience of one Jewish man and what he encountered in London in just 3 days. Three days in hell. Please if you can, consider making a donation. Mine is an independent action and research is expensive and time consuming. Going to events is also expensive. Even producing just one of these piece does take days, sometimes weeks, and whilst I do what I can, there are serious constraints that impact on what is possible. Your assistance can and does make a difference. My deconstruction of White’s last book “Israeli Apartheid”. I believe he is a supercessionist. We supporters of Zionism, the right for Israel to exist. The Jewish homeland. The only country in the world that welcomes Jews. These are the reasons why Israel exists. Israel is also the only country in the Middle East that has mixed-religion classrooms. Gay rights. Democracy. Multiple religions living side-by-side. Where else in the Middle east can this be found? Yet, there are problems. Defense. Defense against stabbings, car bombs, cafe bombs, rioting. This leads me on to Middle east Monitor. Ben White is a regular columnist on this site. There is nothing more to add. However, the responses to his articles are ridden with anti-Semitic diatribes, offensive statements and mostly bu nom-de-plumes. He says he is not anti-Semitic, but he has failed to dis-associate himself from his anti-Semitic followers either. If Israel, Zionism was the problem, then Arabs/Muslims would be living in peace and tolerance with Non-Zionists, Non-Israelis, Non-Jews. How does 9/11, Paris’ Charlie Hebdo, Bataclan, Nice truck jihad, London’s 7/7, Pan Am 103, Metrojet, beheading of Lee Rigby, Brussels, Mumbai, Nairobi, Bali, Madrid, Moscow, Beslan, Allepo, Palmyra and much, ,much more demonstrate Arab/Muslim tolerance and co-existence with others? The meeting, chaired by WLPSC Chair Salim Alam, attracted an audience of c.57 people who heard the speaker give an illustrated presentation on this subject followed by questions and answers. The rules for the meeting were clearly announced at the outset: no questions or interventions except directed through the Chair; no expressions of a racist, sexist or homophobic nature, or offensive to anyone’s religious convictions, would be permitted; the advertised speaker and those asking questions, whether others agree or disagree with what is said, should be heard without interrupting or shouting. Anyone wanting to record or video the event, or take photos, would be free to do so. Ben White talked for about 40 minutes, breaking the subject into three sections: how Gaza was (and remains) impacted by the Nakba; the Blockade of Gaza, its purpose and effects; and the brutality of Israel’s periodic wars against Gaza and of ‘routine’ oppression of Gaza – less publicised but still overwhelmingly more costly in Palestinian lives than in Israeli ones – in between such high-profile campaigns. The framework for understanding all this was that of colonial occupation and both the general analysis and particular features and events were thoroughly documented. Although the subject is one that naturally arouses strong feelings, the speaker’s approach was measured and factual. Questions were taken in batches of three at a time, and included one from a Palestinian. Based on the questions asked it can be reasonably assumed that several came from opponents of Palestinian rights, several from supporters of Palestinian rights, and some who could not be readily identified as being either. Overall there were about 15 questions taken from the audience. One or two of the opponents of Palestinian rights began shouting objections during Ben’s presentation and again during the questions but the Chair successfully persuaded them to behave. A number of those opposed to Palestinian rights disrupted the meeting towards the end, by shouting down the Chair and demanding that the meeting continue for longer, after the chair moved to close the meeting just after 8.30pm (the meeting having started at 7.10 pm). The Chair explained- above the loud shouting from the opponents of Palestinian rights- that it was not possible to extend the meeting for practical reasons and the meeting closed with applause for Ben Whites’ contribution from the vast majority of the audience. Several members of the audience afterwards expressed their appreciation that the event had taken place on a topic of genuine public concern and that it had been well-organised and firmly and fairly chaired. Thank you for your comments. As should be noted, I always publish responses without edit (unless abusive, racist etc.). I do believe my description of the event was accurate and fair. As you know at these events I do nothing but listen and take notes. It is unfortunate that at times PSC see fit to evict me for being nothing more than a journalist they do not like, so I am appreciative of your hospitality. As should also be noted, after the event I came over, spoke to you, thanked you and shook your hand. Personally, I seek dialogue and would be more than happy to participate in an event that brings the two sides together. As we both know, that is unlikely to happen because groups like the PSC do not seek debate or dialogue. For them it is about propagating a narrative and anything that disrupts this singular message is unwanted. 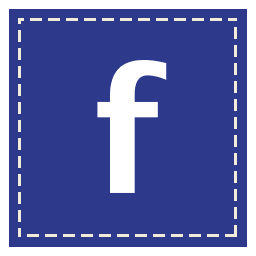 Many of the points in your post are correct. You certainly did announce the rules early on. It is also clear from my own blog that I found nothing offensive in the way you led the meeting at all. In fact, considering the circumstances, I thought you handled it well. My lack of criticism should be taken as a compliment. My presence and the presence of other Zionists did add a ‘risk factor’ to the meeting. As we are both aware even when you seek to eliminate Jewish hatred from an event, audience members can introduce it through their own input (questions). I imagine your early comments warning of possible recording, the presence of cameras and so on, were directed towards attendees for this reason. The PSC know this is an issue and do not need their message side-lined by unwanted publicity about antisemitism in the ranks. We will have to strongly disagree over the ‘factual’ nature of Ben White’s delivery. I have no problem that you see things different from me. We are on opposite sides, with each of us viewing events through a different lens. So, I do not seek uniformity, nor agreement on who is responsible for the current situation. I do have a problem with what is called a ‘narrative’ that demonises one side, removes many events from the page and concentrates on the human aspect as a method of applying guilt. That Palestinians are suffering (especially in Gaza) is a given. This however has nothing to do with cause or solution. Ben White is a propagandist; he is not there to truly educate, he is there to ‘spread the word’ about a ‘racist, apartheid, settler colonial state’. The state Ben White wishes to blame simply doesn’t exist. It is made up. Therefore, the individual facts (such as a casualty count) or even an individual episode of the horrors of war are only a means. The way he ties them together, the way he ignores cause/effect and the facts he leaves out of the story create a narrative that is pure fiction. I also (and I believe I handled the meeting fairly in my description), do find the inability to draw distinctions between Hamas and Fatah unsettling. I find it unfortunate that most anti-Israeli groups (when you start doing something that helps Palestinians, I will start calling you pro-Palestinian), have shifted position over the last few years to become more extreme. Less about dialogue and two states, more about deflecting criticism of Hamas and silently praising ‘martyrs’ (terrorists who murder Israelis). There were some inaccuracies in your response, the number of questions, the time it finished, the make up of the audience and so on, but they are fair. You are entitled to try to ‘spin’ things in your favour. Like I said, we don’t have to agree, nor be on the same side. 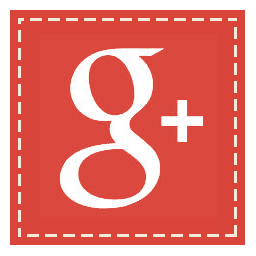 Thank you again for your comments. If you ever seek to hold an event built on dialogue or seek to help to bring the two sides together, let me know. Another excellent post, revealing this ongoing, uniquely acceptable bigotry. Last night (Friday 18th) in Belfast, I drove past around 30 protesters waving Palestinian flags outside the BBC Broadcasting House in Ormeau Avenue, with a large banner saying “Boycott Apartheid”. And so it goes on. David are you saying that all meetings/ lectures/ book launches etc must be balanced and seek to bring the sides together ? That would leave the Israel apologist calender very sparse indeed. I guess we won’t have any more ” we believe in Israel ” events like the last when your worst nightmare and mine, Luke Akehurst, had Annie Cohen thrown out because she wasn’t Zionist enough. Stephen, that isn’t what I said at all. Not sure where you took that from. OK we will leave it for now I have a very busy week. But this is worth returning to. I really would like to get clear what ” If you ever seek to hold an event built on dialogue or seek to help to bring the two sides together, let me know.” means.. It doesn’t mean that the two sides cannot hold events that support their own positions Stephen. What I said in the post was clear, that the Israeli position is to seek dialogue and negotiate. What is also clear is that the narrative pushed by BDS supporting groups like the PSC is to no platform, to avoid dialogue, ‘no to negotiation’. They openly state they see dialogue as ‘normalisation’ which must be avoided. So amidst my criticism of the narrative they did push (a one sided fantasy tale), I stated if they ever actually get around to engaging a rational, peace seeking position that seeks dialogue then they should let me know…. there is no reason they (the PSC) cannot also continue their own events (although a little honesty at one of them would be nice).